FILE - Workers put the final touches on new vehicles at General Motors' plant in Lordstown, Ohio, June 15, 2010. FILE - President Donald Trump speaks at a rally in Biloxi, Miss., Nov. 26, 2018. GM electric vehicles are eligible for a $7,500 tax credit under federal law, but it is not clear how the administration could restrict those credits or if Trump had other subsidies in mind. GM shares extended earlier declines and were down 3.6 percent after Trump's tweets. "General Motors made a big China bet years ago when they built plants there (and in Mexico) - don't think that bet is going to pay off. I am here to protect America's Workers!" Trump wrote on Twitter. 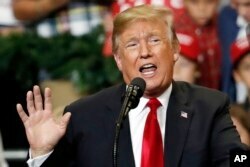 "The president wants to see American companies build cars here in America, not build them overseas and he is hopeful that GM will continue to do that here," she said. 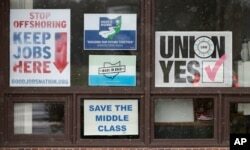 Signs hang from windows at the UAW Local 1112 union hall in Lordstown, Ohio, Nov. 27, 2018. Even though unemployment is low, the economy is growing and U.S. auto sales are near historic highs, GM is cutting thousands of jobs in a major restructuring aimed at generating cash to spend on innovation. Trump told GM on Monday it "better" find a new product for Lordstown Assembly plant in Ohio that will halt production in March. GM has said sagging demand for small cars largely prompted the cuts, but also cited factors including higher costs from U.S. tariffs on steel and aluminum.